We are very excited to announce our new partnership at Skyview Center. 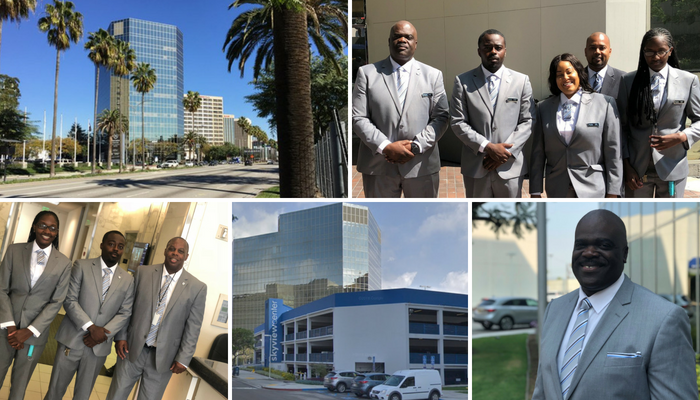 We are ecstatic to be partnering on what is now our second commercial building with Colliers International, as we further penetrate the commercial high-rise vertical market in Southern California. As with all our clients, we are dedicated to making the partnership a success and have completed the initial transition. “We are extremely excited to have GSI as a part of our team here at Skyview Center. The transition this morning was seamless. Over the past several days, I have been in communication with the transition team. At the beginning of the transition Eric Macias was instrumental in providing information about the new guards who would take over the posts at the start of the project. It is interesting what tenants noticed, what a difference it makes just in a suit. Looking forward to a great working relationship.” – Rita Patikas-Hunter, RPA, General Manager, Skyview Center, Colliers International. This win is very close to our EVP, Guillermo Amador’s heart because he specialized in the commercial high-rise vertical for over 20 years. Skyview Center provides another opportunity to showcase how the 20 years of experience that he brings to the table can benefit GSI clients. One of the things I appreciate most about representing GSI as opposed to a large corporate security firm is the flexibility we provide to our clients. What GSI delivers can’t be matched by our competitors. That’s because as a financially solid, owner- operated, private security firm, we have an unparalleled ability to adapt to the specific needs of each client. – Guillermo Amador, EVP, Guard-Systems Inc. The general approach with corporate America is to look at the overall market and then develop packages based on the market’s overall needs rather than the specific needs of each individual client. This approach severely limits options for building managers and owners. Astute General Managers have a very specific vision in mind for their building. They understand that the way security officers present themselves and interact with tenants and visitors is very important. They also realize that if a security company can’t provide the specific answers and solutions asked for during the selection process, then there is very little to no chance, the security company will provide it if they are awarded the contract. It’s been said, “the devil is in the details” which is why we take painstaking care to listen to our clients RFP requests and respond in writing without overlooking even the smallest details. In our experience we have found that listening and responding to each of our client’s specific needs results in innovation. Deploy ambassador guards – These are security personnel who serve as building ambassadors, greeting and welcoming visitors while simultaneously serving as deterrents for crime. Adopt more subtle uniforms – Clients have the option to choose from suits, sport coats, and casual wear so that officers fit client environments. Provide personal touches – This includes holding doors and walking tenants to their cars. Client Services Manager – This is a dedicated position to oversee quality control and ensure each client’s expectations are exceeded. GSI Alert – Ability to mobilize hundreds of guards to cover client-affected areas for a prolonged period in case of emergency. Dedicated rovers – Only 2-3 rovers are assigned to each client’s site, so clients get an officer who is familiar to them and has been trained on site specifics. Custom training – Ongoing client-specific, web-based training that’s fully accredited. Technology – We use GPS and real-time reporting to ensure immediate, on-site accountability. Managers receive daily activity reports and real time incident reports, so they are always kept in the loop. Hiring – Applicants are guided through an extensive screening process and must complete a series of interviews to ensure the best fit. Each candidate is scheduled to meet with our manager, scheduler, operations manager, client services manager, and regional manager. Resources – In addition to our state-of-the-art communications center that operates 24 hours a day, 365 days a year, each branch has qualified supervisors with radio-equipped vehicles around the clock, 365 days a year. At any given time, we can respond to an emergency quickly and efficiently. Supervisors also perform daily inspections to ensure they look their best and are meeting all job requirements. As you can tell, we are really proud of everything we have accomplished here at GSI, and we are confident that our client focused approach to security and the determination to exceed client expectations will allow us to continually raise the bar within the security industry and ultimately allow us to further penetrate the commercial and residential markets.